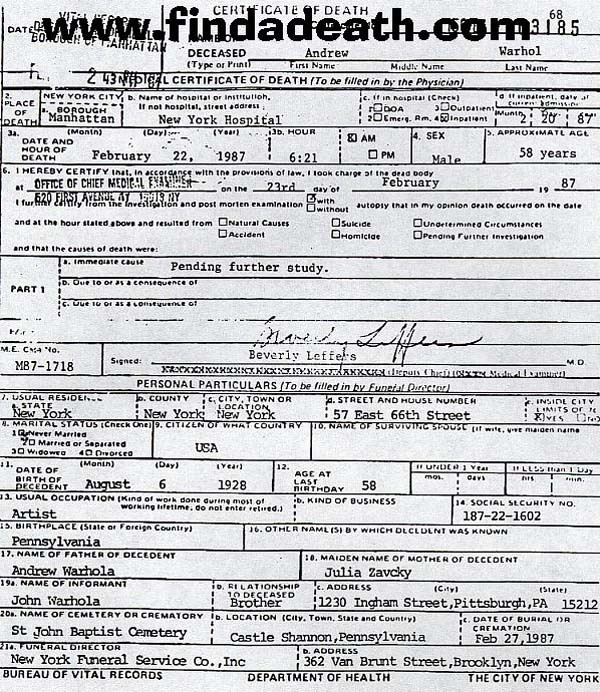 Andy Warhol was born to Slovak immigrants as Andrew Warhola on August 6, 1928, on 73 Orr Street in Soho, Pittsburgh, Pennsylvania. He was a successful illustrator for advertisements in the 1950s, but it wasn’t until the early 1960’s that he became world-famous for his silk-screens featuring Campbell’s Soup cans. After he bought his first camera in 1963, he made a series of movies and eventually launched his own celeb-magazine, called Interview. He was the producer and designer of the first album of the Velvet Underground & Nico. By now everyone in the world knows that Andy coined that whole “15 minutes” thing. He should have put a copyright on it. Psycho Valerie Solanos shot him three times in the chest on June 3, 1968. 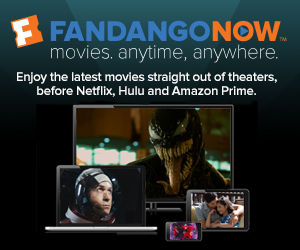 She was in one of his movies a long time before, and wanted Andy to make a film of a screenplay she wrote, which has a name that cannot be mentioned here. Andy was rushed to Columbus Hospital and was at one point pronounced clinically dead. Two months later he was released. Valerie Solanos was the only member of SCUM, the Society For Cutting Up Men. She turned herself in the day after she shot Warhol and spent 3 years in prison. 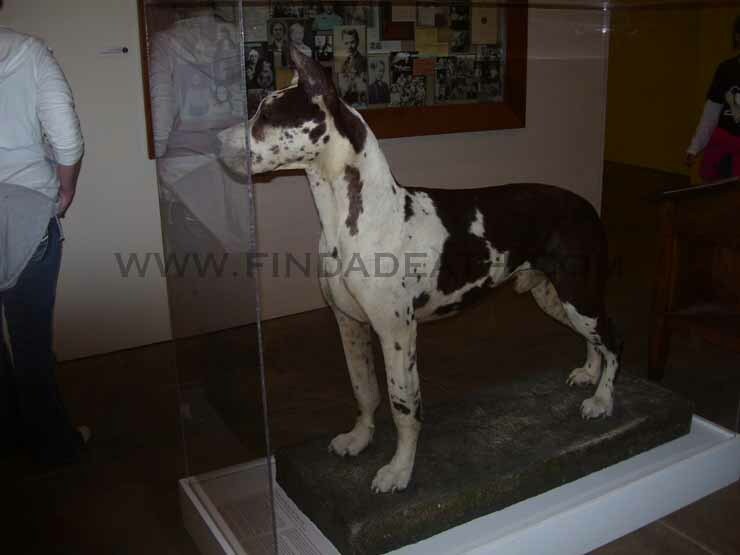 Solanos died on April 26, 1988 of pneumonia. One of Andy Warhol’s last public appearances was in Italy, when he attended the opening of the exhibition of his Last Supper Series on January 22, 1987. Suffering from a gall bladder infection, he returned to the United States. In the days to follow, Warhol went to see Linda Li of Li Chiropractic Healing Arts Clinic for a massage, which didn’t do his gall bladder any good. Because of the severe pain he experienced following the massage, Warhol consulted with Dr. Linda Burke on Saturday, February 14, 1987. He got a sonogram that indicated that the gall bladder was enlarged. On February 19th, Warhol went to see his physician Dr. Denton S. Cox to get a second sonogram, which showed similar results. 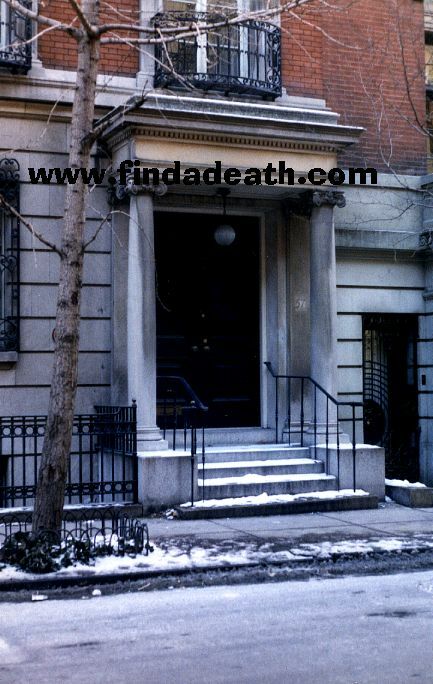 Andy was living at 57 East 66th Street, in Manhattan. and there is now a plaque honoring Andy, in the front of it. 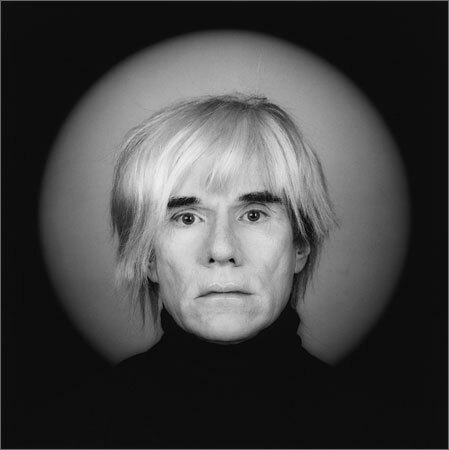 Even though hospitals really freaked Warhol in a big bad way, he checked into the New York Hospital on Friday, February 20 under the name of Bob Robert. He knew his Blue Cross number by heart. Surgery was performed the next day, from 8:45 am to 12:10 pm (EST). 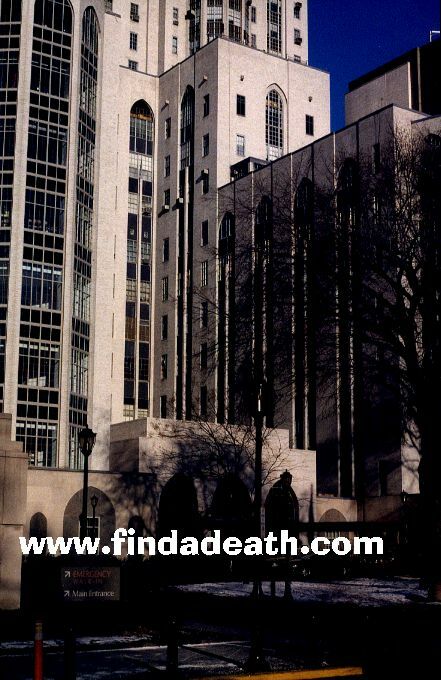 After the surgery, Warhol spent 3 hours in a recovery room, then he was taken to a private room, which was located on the 12th floor of Baker Pavilion. He watched television during the evening and called one of his dearest friends, Paige Powell. At 5:45 am, Warhol turned blue and his pulse had weakened. His private nurse could not wake him, and she called for assistance. The hospital staff tried for 45 minutes to resuscitate him. They even tried to insert a tube down his windpipe but had difficulty because rigor mortis had started. 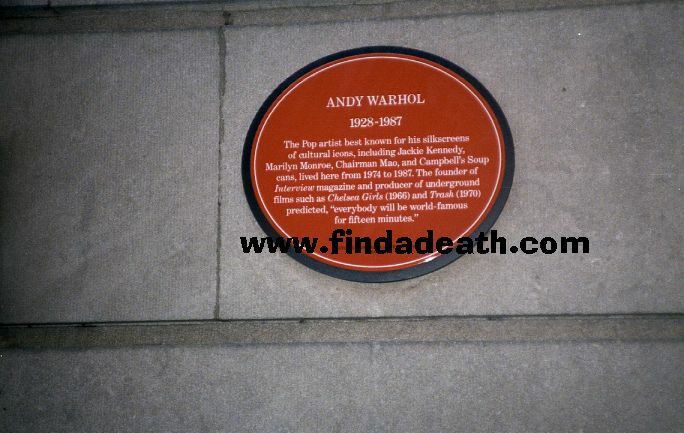 Andy Warhol was pronounced dead at 6:21 am on February 22, 1987. He was 58 years old. An open-casket ceremony was held at Thomas P. Kunsak Funeral Home in Pittsburgh. Warhol’s was solid bronze with gold plated rails and white upholstery. He was wearing a black cashmere suit, colourful paisley tie, a platinum wig, and sunglasses. He was holding a small prayer book and a red rose. The funeral service was held at the Holy Ghost Byzantine Catholic Church. The coffin was covered with white roses and asparagus ferns. After the funeral service, the coffin was driven to St. John Divine Cemetery in Bethel Park. At the grave site, the priest said a brief prayer and sprinkled holy water three times over the casket. Before it was lowered, Paige Powell dropped a copy of Interview magazine, an Interview t-shirt, and a bottle of Estee Lauder perfume into the grave. 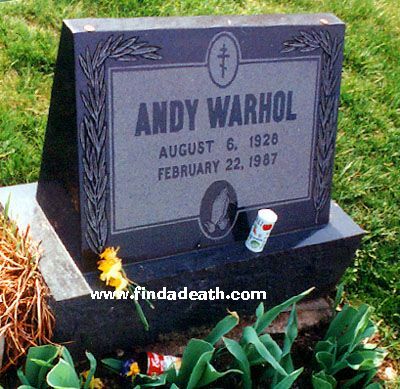 His tombstone was a marble stone with Warhol’s name and dates of birth and death. 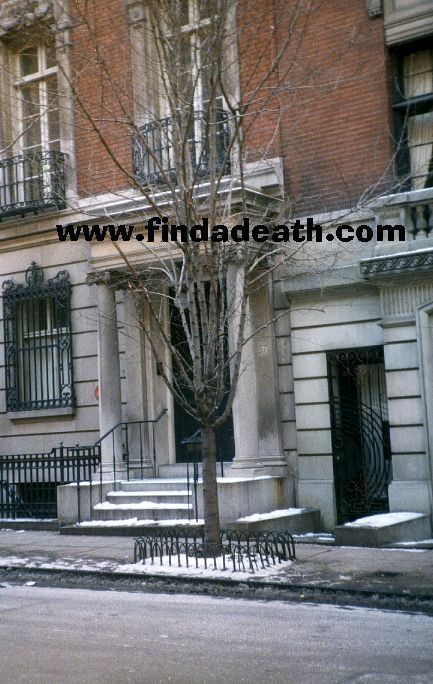 Find a Death friend Sarah Martin sends in this terrific picture of Andy’s grave. Thanks Sarah! A memorial service was held on April 1, 1987 at Manhattan’s St. Patrick’s Cathedral. Bridget Berlin read passages from the Scriptures and Yoko Ono talked about her friendship with Andy. Mourners in attendance were Roy Lichtenstein, Keith Haring, Liza Minnelli and Don Johnson among others. After the memorial, the attendees had lunch at the Diamond Horseshoe. 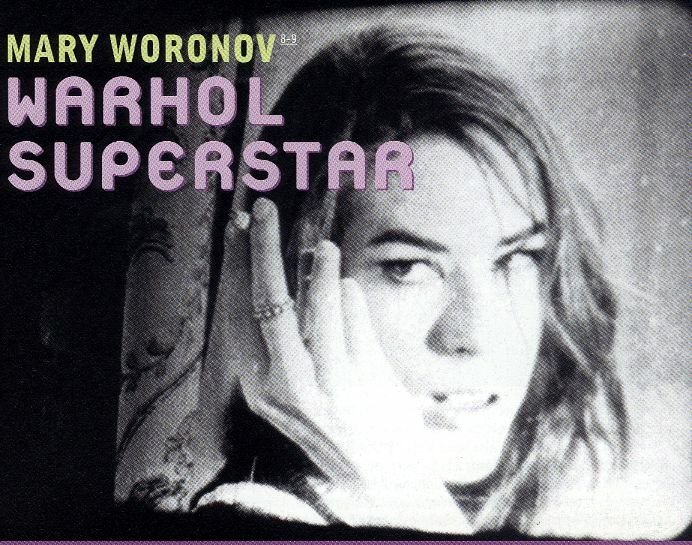 Useless information: One of Andy’s earlier stars was Mary Woronov. She starred in Chelsea Girls. Personally, I loved her in Rock and Roll High School, one of my all time favorite flicks. Rest in peace, Joey Ramone. Mary played Miss Togar, the principal of the school. I always thought she looked like Tim Curry’s mother. She was also in the terrific film Scenes from a Class Struggle in Beverly Hills, with Rebecca Schaeffer. 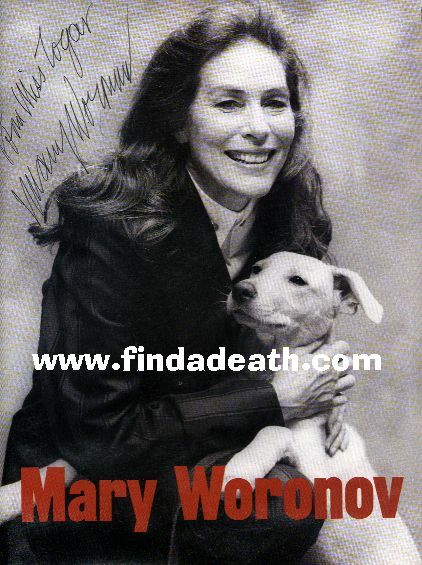 I met Mary in 2000. She was doing a talk here in London. She was really funny, and I asked her about her scenes in Class Struggle. To my surprise, she got pissed off, and said that most of her good scenes were cut, because she wasn’t a big enough name in it, referring to her co-star Jacqueline Bisset. When I asked Mary about Rebecca, she got genuinely sad, and just said that she was a really nice girl. Mary did sign a picture for me. They had an auction of Andy’s stuff after he died. People were paying oodles for every piece of crap he owned. The cookie jar collection got most of the attention, but then there were those silk screens of that damn soup can. Warhol’s diaries were published, and everyone in the New York scene were clamoring to get to the index – to see (mostly) if they made it in, and (secondly) if Andy was nasty about them. There is a Warhol Museum in his native Pittsburgh. 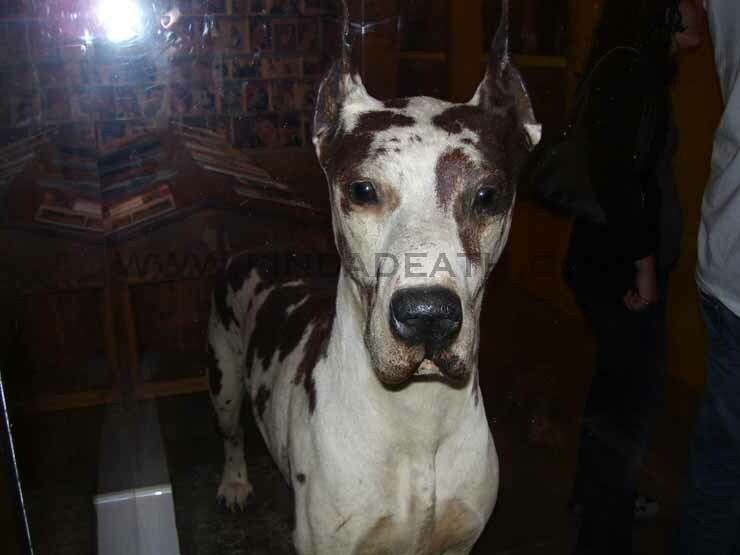 Inside it, is Andy’s dog, Cecil, who is now preserved through taxidermy. Findadeath friend Sarah Martin infiltrated the tight security to snap Cecil for us all to enjoy. 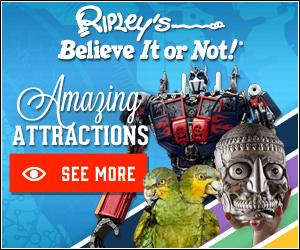 Thanks, Sarah – I’ve seen stuffed pets before, but it really does seem like this one shows personality in it’s eyes. Usually they just looked like stuffed animals. Mostly by Mark from Holland, me, and some pics by Stacey Weinstein of NYC. Thanks, you guys.